One of the driving forces behind the development of Las Vegas and the casino community was the presence and history of organized crime. New attractions are being unveiled in Las Vegas that will look into the city’s infamous mobster past. A handful of museums and interactive attractions will allow visitors a glimpse into the world of organized crime. One of the attractions can be found in the Tropicana hotel, which was once known as a popular hangout for Vegas mobsters. Their attraction was debuted Tuesday, and the hotel has labeled it the “Mob Experience”. Some of the highlights of the experience are the real diary of Meyer Lansky, as well as famous guns and mobster family videos. Tourists should also look out for the museum scheduled to open sometime in late 2011. The location of the museum is inside a courthouse in downtown Las Vegas. This is symbolic as it was this courthouse that first revealed the presence of organized crime. One of the things that Las Vegas is known for is its spectacular collection of theaters and the Las Vegas shows that are featured there. The Venetian is known for continually hosting the hit sensation the Blue Man Group. The entire show is done to a intense percussion soundtrack as the three blue covered men perform music, create art and use everyday materials like PVC piping in new and different ways. The opening of the show features a variety of drums and bright neon paint. While the performers maintain silence throughout the whole show, it does not prohibit them from eliciting funny responses from the audience through their gestures and eye expressions. As the first part of the show includes the use of brightly colored paints being thrown and spat onto a array of white canvasses, those in the first couple of rows are provided with ponchos as protection. 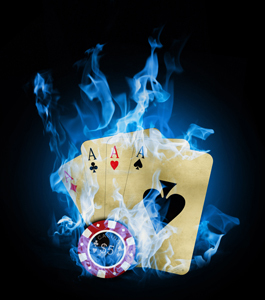 It is an unforgettable show that has received rave reviews since its opening in Vegas. One of the fun factors in visiting Las Vegas is the number of hotels and casinos that are based on famous sites from across the globe. When flying into the city one of the easiest sights to see is the replica of the Eifel Tower. 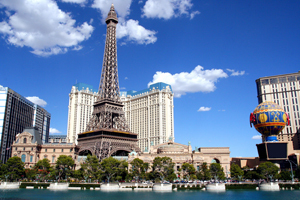 The Paris Las Vegas hotel and Casino is responsible for the 541 foot tall replica. The Hotel and Casino is owned by the Caesars Entertainment Corporation and just opened a little over ten years ago and has seen great success with its Paris theme. The hotel portion of the resort features almost three thousand rooms and the casino covers over 85,000 square feet of gaming space. Some of the other sights to see around this hotel include a smaller replica of the Arc de Triomphe, as well as La Fontaine des Mers, all sights that originate in Paris, France. 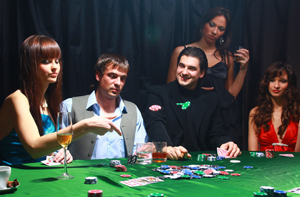 The hotel and casino was recently renovated in 2010 and will continue to implement improvements through 2011. This is one of the most luxurious hotels in Vegas and a favorite for Honeymooners. It is also one of the most romantic hotels and the wait staff cater to your every need. This is a must stay at hotel for young and older lovers alike. You are currently browsing the Lasvegas News blog archives for March, 2011.